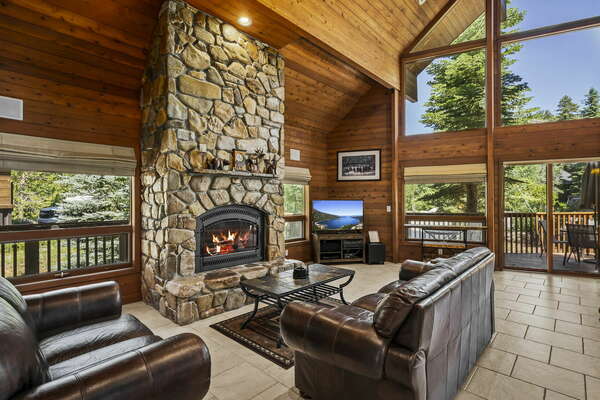 Our Tahoe Donner Vacation Home is truly an amazing place for your vacations, this newer vacation home has everything you'll ever need to experience a great time in Tahoe-Truckee area. Our vacation property is located just off of Northwoods with easy access to Trout Rec Center, Tahoe Donner Golf Course and Tennis Court and Ski Area, Donner Lake Beach is only a short drive away which makes this vacation condo a perfect spot for your winter and summer getaways. As you enter our Tahoe Donner Vacation Condo you'll find an open concept Living/Kitchen/Dining Area with high end ceilings and plenty of light. Just off of the living area there is a hallway that leads you to 3 bedrooms, a bathroom, a closet and a laundry room. The Master Bedroom is at the end of the hallway for extra privacy and it has a big master Bathroom with Shower/Tub combination, very spacious with nice finishes. One of the bedrooms has a bunk bed and a double futon, the guest bedroom has a full. This Tahoe Donner Vacation Condo is the perfect spot to relax after an active day of exploring North Lake Tahoe and Truckee, either read a book by the wood stove or sip wine on the outside deck, it's all set up for your enjoyment. You're sure to love our home away from home just like we do. Guest cards only allow for up to four guests per card. Guest access fees are currently $15 per person per day. Children 6 and under are free.